If you have just moved to a new apartment or house, or if you are renovating your bathroom, one luxury item you may want to equip your bathroom with might be an electric towel warmer. The comfortable feeling of being embraced and dried by warm towels after taking a shower or a bath is priceless, but towel warmers have additional advantages. They are silent and energy efficient, they can also dry your wet towels, and they can help bathrooms stay warm, mold and mildew free. 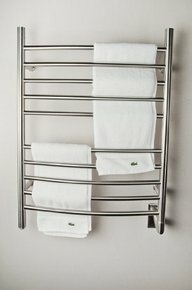 Electric towel warmers can either be freestanding or wall mounted. Freestanding units are usually plugged in to a wall socket, while wall mounted units can be both plugged to a wall socket or hard wired directly to a standard electrical wall junction box. Most electric towel warmers are designed to run 24/7, but they can also be wired through a programmable timer that needs to be purchased separately (the Honeywell timer is recommended, see Amazon products section below). Because towel warmers use little energy, many people keep their unit running 24/7 to have warm towels available at all time and to dry wet towels. Others prefer to turn their unit on only prior to taking a shower or a bath. In this case, make sure that you have a unit that heats up quickly, so you have warm towels available when you come out of the shower - not all towel warmers are equal, and some heat faster and can reach a higher temperature than others. Note that, where there are children and toddlers, it is recommended to get wall mounted towel warmers and to mount them high enough, so they can't touch it in case it gets too hot. This article will compare Amba RWH-CB/P Radiant, Warmrails HSKC/S Kensington and LCM Home Fashion towel warmers. These were not just the most popular among Amazon customers at the time this article was written, but they have also received excellent reviews from most Amazon buyers. Amba RWH-CB (or RWH-CP) Radient towel warmer is made of 304 (18-8) grade stainless steel which is nonmagnetic and has superior corrosion resistance (RWH-CB is the curved brushed model, while RWH-CP is the curved polished model). It's a 150W unit and measures H:31.87 x W:23.62 x D:5.75 inches. It needs to be wall-mounted and hardwired, and it comes with 10 crossbars arranged in 2 groups of 5. This allows for enough space and optimum drying and warming of two large towels or four hand towels at the same time. It can warm up the towels up to 149 degrees Fahrenheit. It weighs about 12 lbs and comes with a 2-Year warranty. The unit is equipped with an on/off switch and when turned on, both the vertical and horizontal bars are heated. It can be operated either using the on/off switch or a wall-mounted 7 day/24 hour programmable timer that needs to be purchased separately (the Honeywell timer is recommended, see Amazon products section below). This towel warmer is available with a brushed (RWH-CB) or polished (RWH-CP) stainless steel finish and includes a matching cover plate. Note that the unit comes with all the mounting hardware you need and is very easy to mount. This high quality and durable towel warmer is in particular praised for its ability to heat up very quickly and provide you with warm towels in very short time. It is sufficient to only turn it on just prior to showering. It starts to warm up almost at once and gets hot pretty fast. Just how quickly it warms the towel depends also on how many layers of toweling the heat has to go through. So turning it on just before you take your shower and turning it off afterwards works well as long as you don't take short showers and give the unit enough time to warm up. If you prefer to leave the unit on for longer periods of time, you may want to consider getting the above mentioned timer to save on electricity. 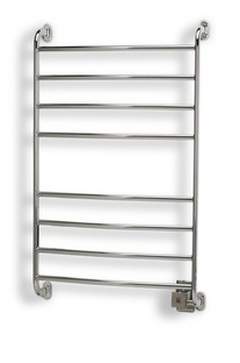 Warmrails HSKC (or HSKS) Kensington towel warmer is a 105W unit made of a zinc alloy, and measures H:39.5 x W:24 x D:5 inches (HSKC has a chrome finish, while HSKS satin nickel finish). It is a wall-mounted unit that comes with 8 crossbars arranged in 2 groups of 4. This allows for enough space to warm a full set of bath, hand and face towels. It weighs about 11.9 lbs and comes with a 1-Year warranty. The unit is equipped with an illuminated on/off switch, and when turned on, both the vertical and horizontal bars are heated. It is designed to run continuously 24/7 to both dry and warm your towels. The cost to run is similar or less than the cost of running a regular light bulb. The manufacturer does not specify the maximum temperature the unit can reach, but users have observed that if someone wants really hot towels, this towel warmer is probably not the best choice as the towels get warm, but not hot-hot. To achieve fastest drying time, have fewer layers of towels so that the moisture can pass through quickly. To achieve maximum warmth, have multiple layers of towels so that the heat is trapped. In case you don't run it continuously, allow at least 2 to 3 hours for the warmth to build up in the fibers of the towel. Though this towel warmer is not made of stainless steel, it looks quite nice and it is available in either chrome (HSKC) or satin nickel (HSKS) finish and comes with all the mounting hardware you need. It can either be plugged into wall socket with the provided cord, or wired directly to a standard electrical wall junction box. It can also be wired to a timer to save on energy. LCM Home Fashion towel warmer is made of aluminum and comes with a brushed chrome-plated finish. It has a versatile design - you can use it as a freestanding or wall mounted unit. Minimal assembly is required to get it working (it comes with wall mounting brackets as well as freestanding feet). It is a 105W unit and measures H:35.6 x W:21.7 x D:13.2 inches. It comes with 6 crossbars and can warm up the towels up to 122 degrees Fahrenheit in 30 minutes. It weighs about 8.2 lbs. If you don't want to spend too much money and don't have a lot of space in your bathroom, you may want to consider this unit. But keep in mind that the difference between expensive models and cheaper ones is that the expensive ones heat up much faster and can reach higher temperatures, acting therefore as true towel warmers. Towel warmers like this one take up to 30 minutes to heat up to capacity and even then, its highest temperature is not warm enough to act as a true warmer, but rather, a slow towel dryer. If you are interested in getting a towel warmer mainly to enjoy the comfort of warm towels after you take a shower or a bath, we definitely recommend the Amba, because it heats up much faster and can reach a higher temperature. With an Amba tower warmer, you'll be sure to have warm towels available every time you take a shower. But if you are more interested in keeping your towels dry, then you could also consider the Warmrails and LCM towel warmers. Even though they heat up slower and can not be as hot as the Amba, if they are kept running for longer periods of time, they will dry wet towels. Note however, that the Warmrails warmer has more drying surface than the LCM and therefore can dry more towels. Please click the product of your choice below for price information or to purchase.